At first glance, the impressive architecture of the globally illustrious office of Sir Norman Foster + Partners is a striking feature of the state-of-the-art multifunctional Hongqiao SunnyWorld Centre in the heart of the Shanghai Hongqiao CBD district. The building complex is located near the fourth largest Chinese airport and not far from the National Exhibition Center. 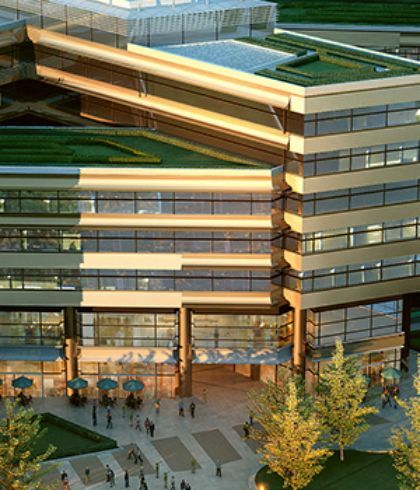 Over 70 000 square meters of commercial floor space surrounded by international hotels, a highly efficient, flexible office and a residential building has been constructed. The ground floor of which is characterized by vibrant stores, restaurants and plenty of space for public use. A generously appointed, parklike green space in the center of the complex is an attractive spot for residents and passersby to while away their time. A displacement ventilation technology is deployed in the heating, ventilation and air conditioning concept of the building complex. In this process, supply air (including outside air) is introduced slowly into the ventilated room through displacement air outlets positioned near the floor. This causes a “fresh air lake” to form near the floor, the air to be circulated upwards on warm surfaces – such as people and computers. Less volume of supply air is required because the air distribution effectiveness is greater than traditional systems. Displacement ventilation is suited for comfort areas as well as for the ventilation of areas with thermal loads (such as in industry). Displacement ventilation is very economical due to the lower required air volume and the lower system pressure for building operation and usually also associated with a lower acoustic load (office, lobby). The control of the air supply takes place via VAV actuators, that are preceded by air coolers. These heat exchangers are equipped with zone valves from Belimo. Such pressure-independent valves on the cooling and heating coils were already defined as a prerequisite when planning the SunnyWorld Centre, as this concept ensures a comfortable room climate and a significantly reduced energy consumption at all times. In public access areas with less strict acoustic requirements (such as entryways, waiting rooms and entrances of elevators), fan coil units (FCUs) are also used for the supply of conditioned fresh air. They are provided with the accurate quantity of water required via pressure-independent zone valves. A total of 2 300 pressure-independent zone valves are deployed across the entire building complex. 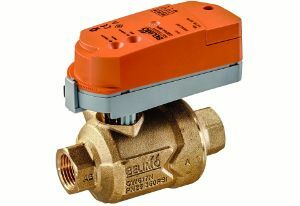 These control valves assume a central role in the HVAC system because they automatically perform dynamic balancing and continually control the flow rate as required. This guarantees that the exact amount of water required is supplied to each terminal unit water coil found in VAV boxes and FCUs. Additional aspects in the planning and realization of the HVAC installation in this challenging building complex were flexible design capabilities, reliable valve design and products requiring little or no maintenance - all of which were factors convincing the building owner to opt for the Belimo solution. The building concept includes advanced, intelligent safety systems, smart building automation and leading edge office solutions. 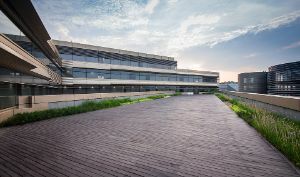 By virtue of its energy efficiency, the building complex has been awarded the Platinum LEED certification (Leadership in Energy and Environmental Design) and the comparable Chinese certificate (Three Star Green Building). The international building structures denoted “green buildings” as to the environmental performance of the building and the transformation towards sustainable design ensuring a comfortable living and working environment. LEED certification is based on a rating system to evaluate buildings with regard to their location, energy, water, material and resource demand but also with respect to room comfort and innovative design. Sensors, damper actuators and control valves for a sense of well-being in rooms: intelligent HVAC components deliver excellent air quality for the highest level of room comfort. State-of-the-art building automation is indispensable in generating good air quality and pleasant temperatures for best possible room climates. But ideal air quality is not the only pre-requisite for room comfort – the pressure ratios between supply- and return air must be maintained in rooms and air ducts. Reliable HVAC components from Belimo perfectly harmonize these influencing factors so that ensured room comfort and productivity prevail at all times in different rooms. Good, comfortable room climates are essential wherever people are; it impacts their productivity and the way they feel. The major factors affecting room climate are indoor air quality, temperature, humidity, and air flow. While there are guidelines for indoor air quality (illustration “Room climate and thermal comfort” by W. Frank), the situation variables such as room function, clothing, activity level of those in the room and simply the very personal needs of room occupants vary greatly. The ability to control individual room climates is all the more important. This is where HVAC building automation comes in. Heating and cooling components in the central plant, air handling units, and terminal units for the room are fitted with sensors, damper actuators, and control valves and are networked with the building automation system (BAS). That system controls the air quality (CO2 concentration and VOCs), temperature, relative humidity, and pressure in rooms, ducts, or pipes accurately and above all with longterm stability. Sensors send the variable reading to the BAS and controllers command actuators and valves to an open, closed, or intermediate position. When one enters a room, the air freshness is key to one’s first impression. The CO2 concentration, depending on the room occupation, can exceed a value of 1000 ppm (parts per million), and cause tiredness and loss of concentration. Therefore, it is important for rooms having varying occupants to measure and control the CO2 concentration and increase fresh outdoor air provided to a room whenever needed. Volatile Organic Compounds (VOCs) are introduced into the air by people and materials in the room, and the odor can be detected by one’s sense of smell. The level of VOCs in the room is controlled by introducing fresh air and adjusting the air exchange rate of the room. The temperature of the room becomes more noticeably the longer one is in it. During the heating period, temperatures that range from 20 to 22° C (compared to 25 to 26° C in summer) are recommended at floor level. Excessively high or low humidity also has a bearing on well-being, productivity and even health. The relative humidity in a room should thus be between 30 percent and 65 percent as minimum and maximum values, depending on the season. Another factor in occupant comfort is the velocity of air movement. When drafts are present (often in rooms where ventilation and air conditioning systems are faulty), evaporative cooling increases on human skin and this can be unpleasant for many people. Air velocity is also important for room acoustics. Excessively high air speeds at variable air volume (VAV) boxes and air outlets can cause distracting noise and whistling.